“For nine years, I struggled with bulimia. I spent my days obsessing over food, and trying to cut calories. My life was miserable, and I was severely depressed. I also struggled with a methamphetamine addiction for years, and my life was nothing short of a nightmare. During this period, I was also dealing with several difficult circumstances including the aftermath of domestic and sexual abuse. Even after I stopped using drugs, I was still consumed with the strife and hurt from the trauma I had experienced. I had no desire to live. I found out about Mercy Ministries from another Mercy graduate named Lyndsey. After hearing her testimony, I decided to apply to Mercy because I was completely desperate for help, and I knew it was my last chance to restore my life. I had been to several treatment centers before Mercy but they were not able to heal me from my eating disorder, depression, drug and alcohol addiction and abuse. Mercy was my last means of hope for overcoming my issues and getting my life back on track. 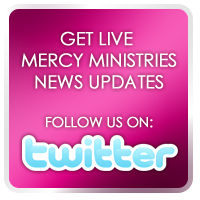 Since I have been in the Mercy Ministries program, God has done so much for me! Through God’s perfect love, I have come to find an inner peace that I have been searching for my entire life. I always felt a void in my life which I unsuccessfully tried to fill by attempting perfectionism through my eating disorder, and using drugs and alcohol. While I was in the program, I leaned that God is capable of filling the voids in my life and He brings true peace. He has revealed His grace to me, and I have learned how to take responsibility for my choices and how to make wise Godly decisions. Congratulations, Cami! We are so proud of you!